Cathie began City and Guilds under Helen Marshall at Newlands College in 1983 and it was about then that she joined the Wellington Embroiderers’ Guild. Her C&G graduating class exhibited as The Gentle Art Company during the 1988 International Festival of the Arts and on other occasions at Turnbull House and in other parts of New Zealand. Subsequently she and fellow C&G students Louise Day and Kerry Barber formed Gentle Art Works. Together they designed and sold various cushion patterns, and they also designed kitsets based on the Globe hangings for Ruth-Mary Beach’s Strand Wools. including President in 1991-92 and she was ANZEG Cook Strait Regional Rep in 1993-95. She was also an active participant in the Central Extensions group. Cathie trained as a Primary School Teacher in Wellington and she was passionate about teaching a wide range of embroidery techniques. She will be remembered especially for her enthusiasm for canvas work and her renowned No Sag Bag. In fact she credited canvas work as playing a big part in her recovery from a brain aneurysm 25 years ago. Cathie taught many embroidery classes locally and organised stitching groups at Alicetown Community House and later at Moera Community House from which she encouraged people to join the Guild. She always showed empathy and great generosity and support to anyone doing a stitching project. Cathie had a wide range of other interests. She was involved with Chamber Music, Choir and the Horticultural Society. She loved gardening and hosted a number of “WWOOFers” (Willing Workers On Organic Farms) at her Lower Hutt home giving them a city experience. It was after attending Conference in Nelson in July last year that she was diagnosed with cancer. 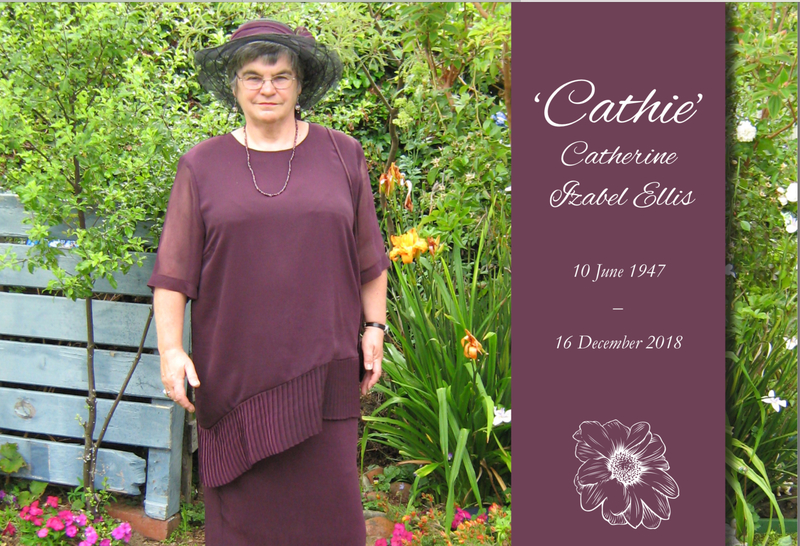 Courageous and cheerful until the end, Cathie will be very much missed by her children and grandchildren and all who knew her. Frances was a foundation member of the Wellington Embroiderers’ Guild, which started 16 June 1966. She was an outstanding and dedicated member right from the beginning, a dedicated textile artist providing help and guidance to many. Before the Guild started she was a member of the Cathedral Linen Guild and an enthusiastic member of Betty Logan’s classes at Wellington High School, from which she enticed a number of people to join the Guild. During her 52 years as a member of the Guild she was president twice, in 1996 and in 2012/2013. She served on the committee a number of times starting from 1969 and was the newsletter editor from 1975 to 1977. Life membership of the Guild was conferred on 9th April 2014. Frances joined most groups that the Guild organises, for example the museum group, and taught a variety of classes. She was a speaker at guild at least once every ten years. a quilt for the Wellington Town Hall in 1984, based on the design of the floor tiles in the Town Hall. Frances managed to achieve all of this while running her own business, teaching music and bringing up a family. Although Frances had been unwell for some time she still managed to attend meetings occasionally and even some Regional Workdays.